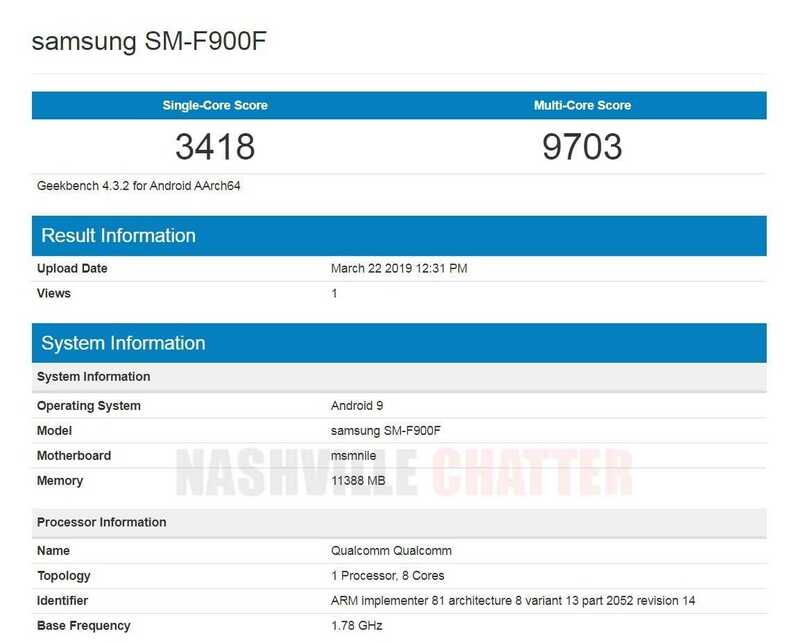 Samsung Galaxy Fold phone with model number SM-F900F has been benchmarked on Geekbench today and the scores are lower than the Galaxy S10 phones. Samsung Galaxy Fold was the first foldable phone teased by Samsung back in November 2018 and officially announced at the Unpacked event on February 20. The Galaxy Fold is about to be launched on April 26 with a starting price of $1,980. Galaxy Fold has a 7.3-inch screen with a resolution of 2152 x 1536 pixels when it is unfolded and a 4.6-inch screen with 1960 x 940 pixels when folded. The 12 GB RAM comes with a storage of 512 GB. Galaxy Fold has a triple rear camera setup with 16 MP, 12 MP and 12 MP sensors and a single 10 MP camera in the front. In addition to these, there are two 10 MP and 8 MP sensors inside. The phone has a battery of 4380 mAh. The phone comes with a 12 GB RAM, Android 9 Pie OS and Qualcomm’s Snapdragon 855 SoC and this is what we see in the Geekbench listing as well. The single and multi-core scores of Galaxy Fold are just 3418 and 9703 respectively. The single-core score of the base variant in the Galaxy S10 lineup, namely the Galaxy S10e, is higher than 4300 and the multi-core score is more than 10,000. The Galaxy S10 and Galaxy S10 Plus have better scores than Galaxy S10e, obviously. In fact, the Galaxy Fold has scored much lower than the Royale’s FlexPai smartphone. Royale FlexPai is the first officially released fully-foldable smartphone. The average single-core score of FlexPai phone found in the two Geekbench listings is more than 3750 and the multi-core score is around 10,000. Royale FlexPai has the same Snapdragon 855 processor and has just 6 GB RAM vs. Galaxy Fold’s 12 GB RAM. Though Geekbench scores can’t be totally relied upon, they can’t be ignored altogether either. We may see new Geekbench listings of Galaxy Fold in the coming days with much better scores. We may also see the rival Huawei’s foldable Mate X foldable phone on Geekbench in the coming days. Let’s see how it plays out and which foldable phone offers better performance and establishes itself as the leader in the fast-growing foldable category. Stay tuned for more updates.